Black tie events include things like fundraisers and galas, and they’re an opportunity to don your formalwear. Event invitations will usually say if they have a black tie dress code, so you shouldn’t be stuck wondering how much you’re expected to dress up. 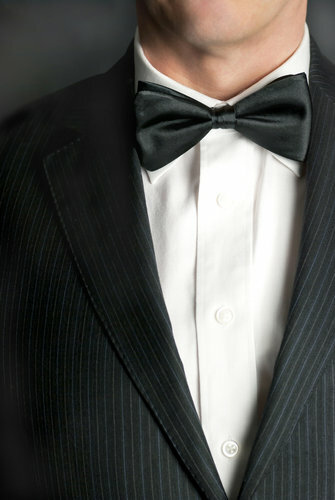 If an event is designated as black tie, you should wear a black tuxedo with a black bowtie. If you don’t own a tuxedo, consider renting one. Another appropriate choice is to wear a black suit with a vest made out of the same fabric as your suit, a crisp white button-up shirt, and, of course, a black tie. A crisp pocket square also adds a nice touch. Conferences, interviews, and networking events often call for a business professional wardrobe. Additionally, some offices have a business professional dress code, so if you’re starting a new job, make sure you’re familiar with their requirements. Men’s professional dress typically means a dark-colored suit, a button-up dress shirt, and dress shoes in either brown or black leather, depending on the color of the suit. It’s okay to add some color with your shirt and tie, but don’t choose anything too garish. Remember, you want people to remember your personality and professional qualities, not just your clothing choices. Some offices have a business casual dress code, and this look is usually appropriate for company outings and certain networking events as well. 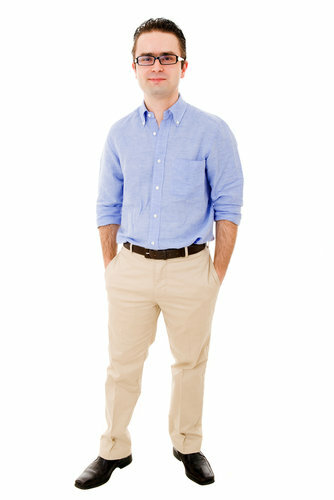 Consider wearing khakis, chinos, or well-pressed suit pants with a button-up, collared shirt and a blazer or suit jacket. You don’t need to wear a tie. You can also opt for some brighter colors, but make sure you don’t choose any distracting patterns or colors that clash. Even if you’re at a business casual event, there are certain fashion choices that you should always avoid. Remember, even if you’re dressing down, you’re still at a professional event and want to make a good impression. Never wear jeans, and make sure that any pants you do choose to wear aren’t too loose and baggy. At the same time, they should not fit too tightly either. For the best look, have a pair of suit pants professionally tailored to fit you. Don’t wear a T-shirt or any kind of untucked shirt. All shirts should be neatly pressed and, as with your trousers, a good fit. When you’re wearing a suit jacket or blazer, you should have about a half-inch of your dress shirt sleeves sticking out past the jacket sleeves. When it comes to shirt colors, solid tones or a subtle checkered pattern are usually best. Never wear anything with the kind of pattern you would see on a Hawaiian shirt or reruns of The Cosby Show. Dress shoes are the only appropriate footwear choice for any kind of professional event. Avoid worn out or scuffed up shoes. Make sure to shine your shoes before big events, and if they do seem to be getting worn out, it’s time to invest in a new pair. Avoid messy hair, dirty hands or fingernails, and strong cologne. If you have any visible piercings, be sure to take them out before professional events, and if you have any tattoos, they need to be covered.